Jun - 11 | By: Sofia Moore | no comments. 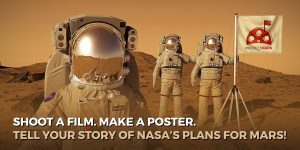 NASA is inviting college students and early career professionals to express their visual interpretation of NASA’s deep space exploration initiative from the Earth to the Moon and onto Mars! riter and producer of National Geographic Mars; Joshua Grossberg, VP Creative of McCann NY, a world-renowned advertising agency; and NASA astronauts! Winning entries will be screened around the world at Opening Events at NASA visitor centers, NASA museum consortium members, and other interested venues in Fall 2018, and also during follow-on events throughout 2019. The top film will win $10,000 and the top poster will win $1500. In addition, winning trailers and posters will be seen at 250 Cinemark Theatres across the United States with the winning film featured ahead of the First Man screening in October.